Is Fox’s new baseball series Pitch a home run? No, but it has the potential to score a ratings win if it doesn’t fall victim to convenient romantic storylines rather than allowing the show’s main character to stand on her own. Hopefully the writers won’t take what could be a female empowerment story that inspires young women and lessen its impact with clubhouse romantic entanglements and unnecessary love stories. 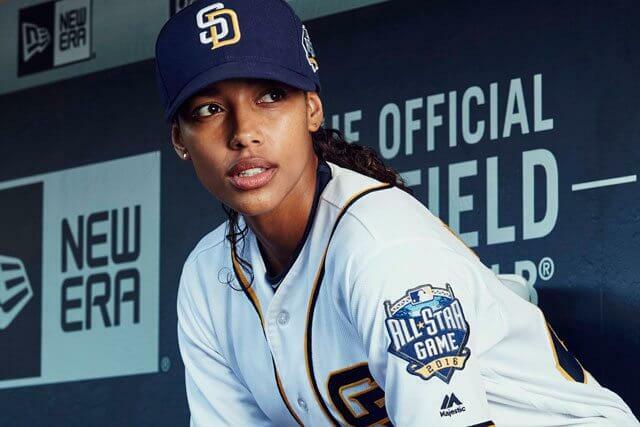 The series stars Kylie Bunbury (Under the Dome) as Ginny Baker, the first female baseball player to make it to the major league. Baker’s a talented pitcher who’s called up from the minors to fill the fifth spot in the San Diego Padres’ rotation. The first episode explores a little of her backstory, including how her father (Michael Beach) spent long hours teaching her to not only throw a nasty screwball but also to never give up on their shared dream of baseball greatness. Unfortunately, his constant demand for practice and perfection led to Ginny feeling resentful over the fact she didn’t have a normal childhood or close friends. Those lingering daddy issues will apparently rear up throughout the season. Episode one also introduces the colorful characters who’ll pack the Padres clubhouse led by Mark-Paul Gosselaar as Mike Lawson. Lawson’s an all-star catcher whose job it becomes to not only settle Ginny’s nerves on the field but also back her up in the clubhouse. Obviously being the first female player to venture into this all-male club upsets the applecart, so she’s fortunate to have center fielder Blip Sanders (Mo McRae) in her corner. The two became friends during their days in the minors, and Blip’s wife Evelyn (Meagan Holder) is one of Ginny’s few confidantes. Also in Ginny’s corner is her take-no-prisoners agent played by Ali Larter. Larter chews the scenery as Amelia Slater, a passionate, dedicated, and determined agent who left Hollywood to dedicate herself to just one client: Ginny. Amelia’s job is to promote – and protect, when necessary – the first female in Major League Baseball, and that means she’ll be butting heads with Padres General Manager Oscar Arguella (Mark Consuelos). There’s even a Gerard Butler name drop as Amelia quickly and effectively puts Oscar in his place. Obviously Ginny’s going to be sticking around with the Padres for a while or else Pitch would end in a matter of episodes, so it’s not a spoiler to say that whatever hardship she’s going to face won’t lead to her getting kicked off the team anytime soon. Pitch was made with the support of Major League Baseball, so it’s also highly unlikely we’ll be seeing anything controversial incorporated into the storylines. San Diego’s Petco Park is actually used to film the series…and I have to throw this in as a disillusioned, constantly disappointed native San Diegan/Padres fan…it’s nice to see it depicted with a big crowd and enthusiastic applause. That’s a rare sight given the Padres’ dismal win/loss record over the past six years. The Padres haven’t had a winning season since 2010, and my initial thought when Pitch’s first trailer arrived was maybe we should find talented female ballplayers to not just pitch but fill more positions on the field in real life. It couldn’t hurt at this point. What’s going to sell this series to viewers is not just the premise but also Kylie Bunbury’s outstanding performance. Bunbury’s Ginny is not just a ground-breaking baseball player who’s given #43 to wear because it’s one number up from Jackie Robinson’s retired number. There’s a lot of emotional depth to the character thanks to Bunbury’s performance, and she completely draws in the audience and gets them to root for Ginny to overcome all odds. Mark-Paul Gosselaar’s a surprising choice to play catcher, but it works and best of all the chemistry between Mark-Paul Gosselaar and Kylie Bunbury is evident from their first onscreen meeting. Again, hopefully the writers will smartly avoid the clichés and not throw them together as a romantic couple but instead allow them to grow as platonic teammates. On a side note, it’s also nice to see two Sons of Anarchy alumni – Mo McRae and Michael Beach – reunite with SoA director/executive producer Paris Barclay who also handles those duties on Pitch. Pitch has an intriguing setup and a terrific cast. It also has a lot of heart along with some decent baseball sequences. It’s impossible to tell from just one episode, but Fox has the potential to hit one out of the park with Pitch. The pilot delivered the heat, now let’s see if episodes two, three, and four can keep the momentum going. Pitch will premiere on September 22, 2016 at 9pm PT/ET on Fox.